In this classic work of spiritual reflection and exploration, Fr. Peter van Breemen reminds us that in an age where everything seems temporary, the love of God is permanent. God won't let go of us. In this beautifully written, personal exploration, van Breemen enters the depths of forgiveness, mercy, compassion, and resurrection. A book written for our age, its message is timeless: there is absolutely nothing that can sever us from the love of God. Inspired by van Breemen's series of retreats in Bingen, Germany celebrating St. Hildegard, The God Who Won't Let Go is a gift, an invitation for each of us to experience for ourselves the God whose love is life's foundation. Here van Breemen becomes our own retreat partner, walking with us into the very heart of God. Experience life's center, the love of the God who holds onto us through every turn in our lives. Peter G. van Breemen is author of several books, including As Bread That Is Broken, Called by Name, Certain as the Dawn, and Let All God's Glory Through. His influence on the church stretches worldwide, as his best-selling books have been published in many languages. He presently resides in Aachen, Germany, where he is a retreat director and spiritual director. As a Protestant I started reading books by Catholic writers about 10 years ago starting with books by Henri Nouwen. I found they spoke much more to my circumstances than the Evangelical Protestant books I was used to reading. Instead of further instruction on "biblical living" they told me of a God who was with me in my troubles and constant failings, a God who I found very winsome. As van Breemen would say "a God who loves me as I am and not as I should be". However, as I would read these books my Protestant thinking would kick in with questions about how scripturally based they were as I read about this almost-too-good-to-be-true God. I worked my way through various authors, Nouwen, Basil Pennington, and others, as when one author would quote another author I would often check out the second author if I liked the quoted material. This finally led me to Peter van Breemen who has since become my favorite. Van Breemen writes of a "loving God" to match any of the other authors I liked and yet his books are also very grounded in scripture (and satisfy my Protestant paranoia)! They blend presenting a God who loves us unconditionally and eternally with all the challenges that Jesus and scripture present us with as we are called to conversion. And because these challenges to conversion come in the context of descriptions of God's ever-new love they enable my faltering and faint heart to sometimes say "yes"! I would highly recommend this and any of vB's books. My only caution is that his books often seem to come from oral presentations he has given and therefore have a different feel to them than a book that was written from scratch as a book. Peter van Breemen, a Dutch Jesuit, is a popular author who has penned a number of books on spirituality. His writings reflect his training in the Spiritual Exercises of St. Ignatius and are peppered with his vast knowledge of many subjects and his keen understanding of the human condition. The readers of THE GOD WHO WON'T LET GO will certainly see these characteristics of van Breemen at work. Van Breemen would probably be the first to admit that what he says is not all that new or original, but he presents the material in a manner that is both fresh and engaging. He focuses on a variety of themes common in the Christian tradition: God's love, the heart's deepest desires, vocation, redemption and forgiveness. These themes are based on the life and ministry of Jesus Christ, and van Breemen pays special attention to the death and resurrection of Jesus Christ as he explores these themes. The chapters of the book seem to flow from one to another rather than read like a treatise, and readers may wonder in what direction van Breemen is leading them. Yet after the book is completed, it is easy to see how it works as a whole, much like talks on a retreat. Since van Bremen does retreat work and spiritual direction, it is likely that he conceived of the idea for this book based on his retreat experience. The book is not meant to be read in one sitting and readers who do so will probably miss much of what van Breemen has to say. The book is ideal for spiritual reading. The chapters are concise and do not take a great deal of time to complete. The chapters also end with short prayers which can lead to further reflection. While the book can be appreciated by just about any audience, it will probably be best appreciated by people familiar with Ignatian spirituality. Van Breemen writes in a style that can reach people at just about any spiritual level in a way that is respectful of a person's intelligence and challenges those who believe they have heard it all before. 5.0 out of 5 starsA favorite! I love this book! As a healer it is one that I turn to often. I had already read it for myself but read it again to my dad while he was dying. I loaned my copy to a client when she was dying but never got it back from her family so I bought a kindle version this time. It is a great book, not just for dying! It just seems those near the end really appreciate the healing wisdom shared. This is the kind of book that you read one page and sit with it and let it stir. It is worth the purchase just for the writings of the Ten Commandments - they are written as freedoms. 5.0 out of 5 starsForgiveness is about love. 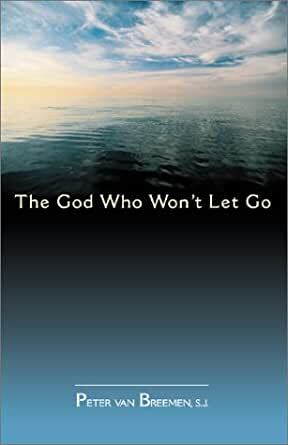 The God Who Won't Let Go, which is translated from German to English in only 154 pages, flows smoothly and catches your attention because you know he understands the subject. You would expect this to be an esoteric, theological book, but it is deeply personal. He explains the difficult struggle on the part of many to understand how they can count on God to be a loving father rather than a taskmaster. God doesn't give up on us. The author, Breemen, masterfully points to our tendency to hold on to past guilt as if we could achieve peace of mind by examining our conscience independenly of God. But more than than that, we might believe that he isn't really loving and would abandon us. The author addresses how individuals can seek forgiveness in confession to improve themselves so that little by little the penitant can grow in virtue and leave behind bad habits. There is never a blame game as God loves us more than we know. He gives us the grace we need to make the changes. The Prodigal Son parable is a good example Breemen used to exemplify the loving, merciful God. In the last chapters, he discusses our relationship with Jesus, both the crucified Jesus, and the Risen Lord who can awaken love within us. Breeman's clarity and an expressed confidence in God suggest that he himself has gained from a long struggle to understand how much God loves us, and perhaps has achieved some of the peace of mind that he hopes we can achieve as readers. Each of the twelve chapters was like being on a mini-retreat. The spirituality explained by Peter G. Van Breemen was simple yet very Biblical with frequent Biblical quotes. Certainly, one would feel the magnitude of God's love for us after reading and reflecting on this book. It is one I will hopefully re-read again at a later date.